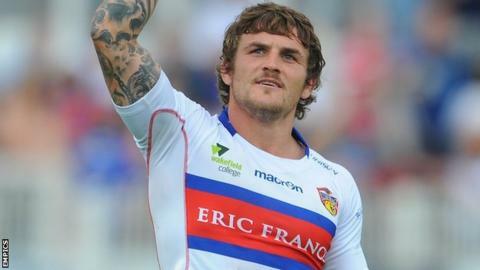 Wakefield extended London Broncos' winless start to the season with a convincing victory. Danny Kirmond finally made the Wildcats' pressure pay shortly after the break, finishing from close in. Cockayne crossed for a second time before tries from Peter Fox and Richie Mathers rounded off victory. Richard Agar will feel his side have gained some revenge for their 36-0 defeat by the Broncos at The Stoop last season. The Wildcats were ahead after just 50 seconds, Cockayne receiving a pass from Reece Lyne to ease home, leaving Sykes to kick the extras. Great defending by Shane Rodney prevented first Tim Smith and then Cockayne from adding to Wakefield's lead before half-time. Sykes then kicked a penalty before a powerful break from Ali Lauitiiti was finished off by Cockayne just before the hour mark. Kieran Dixon thought he had put his side on the board when he raced clear but his try was ruled out for a knock-on. Fox then touched down in the corner, before Mathers rounded off victory when he raced through a gaping hole in the home defence. "The answers are on the inside for us. If you keep expecting the negatives then that is what you are going to get. "We had chances to get into good positions today, but we did not take them. "We have to stay strong, stick together as a group and find the positives." "To see the improvements we have made from week one is really pleasing. There were times we needed to step it up and today we did. "We know we can attack and score from pretty much anywhere on the field, and it is our improvement defensively that pleases me most. "We have some really tough games coming up and we need to keep that defensive effort going. We are certainly moving in the right direction." London Broncos: Robertson, O'Callaghan, Hurst, Lovell, Dixon, Witt, Gower, Kaufusi, Randall, Wheeldon, Rodney, Cook, Bailey. Replacements: Bryant, Krasniqi, Lee, Melling. Wakefield: Mathers, Fox, Collis, Lyne, Cockayne, Sykes, T Smith, Poore, Aiton, Raleigh, Lauitiiti, Kirmond, Washbrook. Replacements: Wood, Amor, Wilkes, Annakin.